Synopsis: The other day in Germany: The Key Account Manager John Smith is told by his boss to create a Key Account Plan for an important, strategic customer. Should he now quickly prepare a PowerPoint presentation and show it to his boss so he's satisfied? Is a Key Account Plan actually a presentation or a real tool? If it actually is a tool, what characterizes a good Key Account Plan? How should such a Key Account Plan be structured? Should the Key Account Manager prepare this plan by himself? Just as he is contemplating all these questions, he stumbles on an interesting survey. According to this study only 20% of Key Account Managers said that they actually use this plan as a tool in their daily work, but it was this 20% that was more successful than their competitors in the year of the crisis in 2009! The conclusion from the survey catches John Smith's attention and he decides not to prepare a mere presentation but to make the most of the Account Plan by using it as a real tool. If you can identify with John Smith, this book is for you. 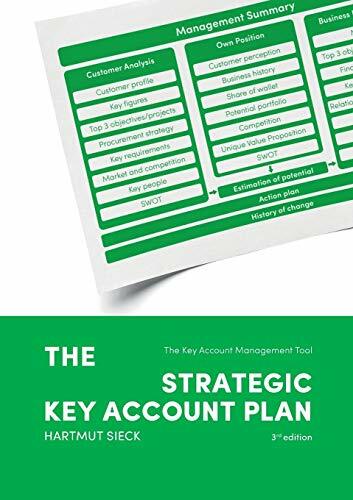 This book will help you to structure and prepare a Key Account Plan in a professional manner. You have already prepared an Account Plan? Then use this book for a thorough scrutiny of your plan. This book is intended to be used as a guide for your work, so you can immediately put into practice what you have just read. About the Author&colon; Building on a ten-year career in industry, Hartmut Sieck founded SIECK consulting in 2002. The business consultancy focuses on key account management, sales / selling in B2B, and time and self-management. In the course of his work as a business consultant he guides holdings and medium-sized companies globally when introducing and developing key account management and sales structures. As a trainer and sales coach he helps companies in training and developing their sales personnel. Hartmut Sieck is a founding member of the 'European Foundation for Key Account Management' (EFKAM) that deals with quality standards in Key Account Management. He has published nine books, among them 'Key Account Management'. This book will accompany you while you systematically introduce and develop your key account management. At the end of 2015, he added the book 'The Key Account Manager', which serves as a guideline for all key account managers.